Having thousands of pictures on my camera roll is something you could always fault me for....but that's a thing of the past now! It's no secret that I love taking pictures. My camera roll is full of pics of the kids, places we have visited, trips we have taken, screenshots of ideas or recipes I would like to try. I also love to be organized, partly because it makes me feel better and partly because I don't work well with a mess around me. Being on our phones more often than say, 10-15 years ago leads to more things on our hand-held devices. 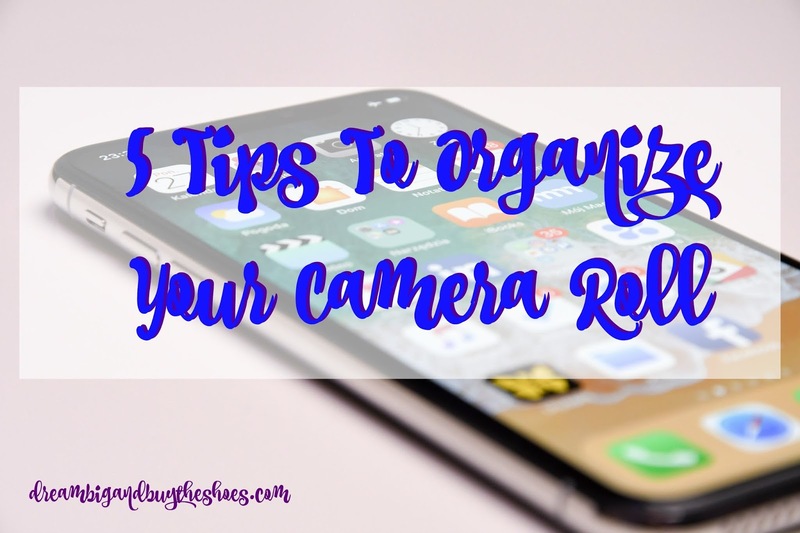 Today I would like to share some tips that have helped me keep my camera roll organized and pictures that I want to access a fingertip touch away. My tips are iPhone based, but depending on the brand of phone you have you could easily adapt to these. One thing I love about the iPhone is the ability to make folders. I have folders of Bella's birthday, our trip to Boston in 2016, trips to Vegas, Ethan's first day of middle school and high school, etc... One folder you should definitely have is a "to edit". For us bloggers who want to consistently post to Instagram, but at times may be out of inspiration or fresh pictures, it helps to have a folder of photos waiting for you to share at a later time. Sometimes these photos may be leftovers from a vacation, a scene from a recent walk, or your latest home decor purchase from Target. Save these random photos in a folder to share when you feel inclined to. You need to have those pictures saved in case something happens. While I do use my iCloud, I'm kinda crazy and want something else set up. I use that 5GB that iCloud gives you for free rather quickly. I began using Google Photos since it's unlimited storage and it's completely FREE.You can also search by faces, place and things in the picture (example- dog, wedding, Las Vegas) and it's super easy to categorize your memories.I highly suggest Google Photos and have been super thrilled with the app since I started using it less than six months ago. If you want to make albums easier, use tools on your phone like the "search and select" option, like on the iPhone. Go to your camera roll, search a date, or place/location, select all the photos you want to move and then create an album. This can save a ton of time when it comes to organizing. Also, if you choose to use the Google Photos app and want to clear out your camera roll and delete the pictures that were just backed up, the app allows you to do this with the push of one button. Work smarter, not harder! When I am taking pictures for the blog, most often I am using my iPhone since it takes amazing pictures and is easiest for me. I will take a bunch of pictures of the same thing, angling my camera various ways or moving things in and out of the frame. When I think I am finished, I will take a quick glance and favorite some of the best images. Simply tap the heart button at the bottom of the photo and it will save it in to your albums, under Favorites. It's a great quick way to save your best photos. How do you organize your camera roll? Any other tips to share?! Happy organizing!